Dr. William J. Morton (1845–1920) hurried his book The X-Ray: Or, Photography of the Invisible and Its Value in Surgery into print in September 1896, a mere nine months after Wilhelm Röntgen made public his discovery of the new ray. The news of a strange kind of radiation that defied all standing theories of light and matter—and enabled people to see through opaque objects—had generated worldwide excitement. Almost overnight the mysterious rays and their eerie images began to circulate not only in scientific and medical journals but also in newspaper and magazine articles, advertisements, stories, songs, and cartoons. Physicists rushed to experiment with the new rays that seemed unrefractable and indifferent to electromagnetic fields, while other investigators attempted to use them to capture all kinds of objects previously hidden from the human eye—from hearts and bones to thoughts and souls. Properly exposed X-ray plates captured clear outlines of the skeleton and also softer tissues, such as the skin, muscles, tendons, and even veins and arteries. 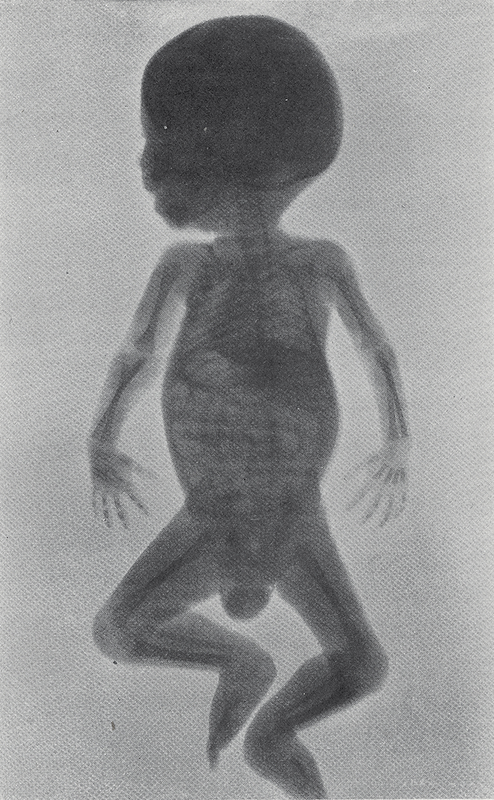 But many of the finer details could be lost in the transfer to print This image displays the first-ever outline of an infant’s liver within its natural surroundings of flesh and bones (although the printed image is flipped so that the liver appears to be on the wrong side). Morton was the professor of “Diseases of the Mind and Nervous System and Electro-Therapeutics” in the New York Post Graduate Medical School and Hospital and one of the first American physicians to experiment with the new rays. His father, the dentist William T. G. Morton (1819–68), in a September 1846 tooth extraction had famously demonstrated the magical powers of anesthesia, a miraculous technology that would revolutionize surgery. Half a century later, it was his son’s turn to demonstrate, to the medical profession and the public, a miraculous technology—the magical powers of new rays that could look into the human body without cutting it open. Written with the help of electrical engineer Edwin W. Hammer, Morton’s little green book describes the electrical apparatus and photographic techniques essential to X-ray photography. It quickly became popular among doctors, surgeons, dentists, and others who were contemplating the addition of an X-ray apparatus to their laboratory or office. The complex relations between the electric apparatus and the properties of the rays it emitted were far from understood in 1896. If the rays were too “soft,” they barely passed through the skin; if too “hard,” they passed through the thickest bones and produced little contrast on the photographic plate. The only reliable way to calibrate the rays’ penetrating power was for the operator to inspect his own hand against the fluoroscope screen. No precautions were taken against the radiation exposure: no one suspected the dangers involved. Morton did note that, after prolonged X-ray sessions, his eyes often got sore and his eyelids were often inflamed. Many X-ray pioneers would die of painful debilitating cancers before the danger was recognized and protective measure taken. 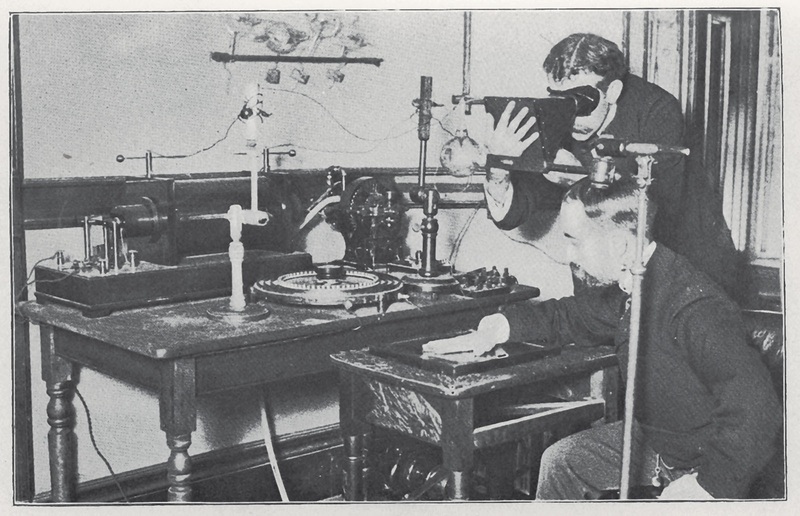 The apparatus in early X-ray photography: a huge induction coil (on the table against the wall) provides high voltage to drive the rays in a partially evacuated gas tube; behind it, in the back corner, a motor-operated interrupter repeatedly breaks the direct current supply to create magnetic-field changes for induction. The large flat disk in front of the table is the power control, made of an adjustable resistor. A rack on the wall holds spare gas tubes. The complicated interactions between the electrical characteristics of the tube, its gas pressure, and the properties of the rays it emitted were not well understood. Much of the operator’s expertise lay in knowing his tubes by heart and choosing the right one for the task. Rapid improvements in the infant technology soon allowed for ever shorter exposures and increasingly better imaging. Mastering X-ray technology was not enough, though. Medical practitioners would need more experience and training before they became competent to reliably read the exotic images and distinguish between normal and pathological appearances. It took more than two decades for the medical professions to fully adopt the new visual technology and combine it with traditional diagnostic methods: interviewing, listening with the stethoscope, and touching the body. Tal Golan holds a PhD from the University of California at Berkeley (1997) in the History of Science. His areas of specialization are: history of science in the 18th and 19th centuries, history of Israeli science; history of science policy, and the relations between science, technology and law. He is currently on the faculty of the University of California, San Diego, Department of History.